This is the second volume in Mark Bebbington's traversal of the solo piano music of Sir Arthur Bliss, recorded in Symphony Hall, Birmingham. Bliss was Master of the Queen's Music from 1953 until his death in 1975 and made a greatly significant contribution to British music throughout his life. He composed music for over 60 years, and amongst his widely-admired output is his contribution to music for the piano. 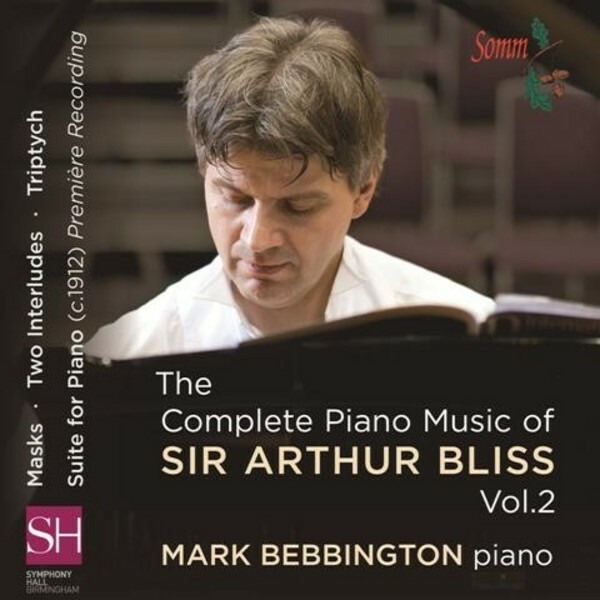 Mark Bebbington's first Volume of Bliss's Piano Music [SOMMCD0111] attracted warm comments throughout the classical music press, and on this succeeding album he includes music from throughout Bliss's long career, from the early Suite of 1912 (a world premiere recording) to his final masterpiece, the great Triptych of 1970. Mark Bebbington's remarkable series of British piano music on SOMM has produced some truly superlative recordings, and this new issue is sure to join its predecessors as a disc worthy of a place in any collection.